Once we all thought that short hairstyles can be styled in one way only, that your image will be dull and common if you keep hair short, and only women that can't grow longer hair will have it short. The rest of women for sure should grow long tresses and enjoy the many styles it allows. But it was once. Now I can confidently say that short haircuts became very versatile. Hair stylist invent new designs and styles and add details to the ones we know. Mostly it concerns African American short hairstyles, cause their hair type is thick and healthy and looks fabulous on short hair. I even have to say that there are ladies that seem to be born again with shorter haircut that injects life to their routine image. So let's have a look at short hairstyles for black women and get a doze of inspiration. Vivid and rapacious, she seems to be on the wave of success with this undercut pompadour hairstyle. In fact undercut hairstyle is very daring by itself and when combined with such a roll on the bang and elegant make up and clothing, it just leaves speechless. Even though the naughty curls remind of a little demon, such short haircut looks very cute. Short pixie haircut for black women looks stunning, who could imagine that vast curls can lay down so softly. African American shag haircuts are of great popularity, this shaggy bob with highlights proves it. 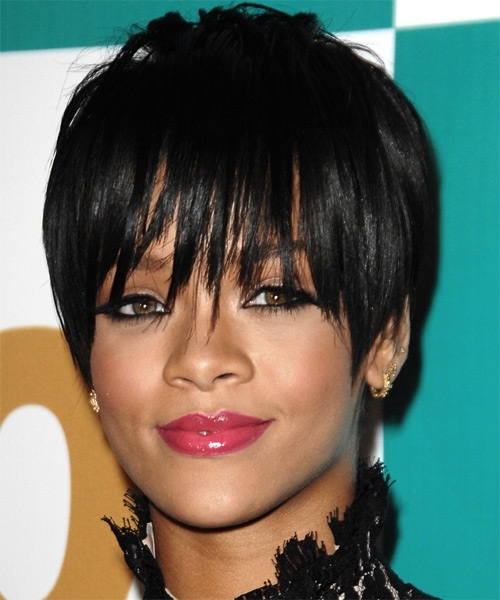 Elegant bob haircut for black women looks really worthy when designed with such a flirty twist on the front part.